Kyoto City will start to collect \200 per person per night accommodation tax on guests staying at hotels or other lodgings inside Kyoto City. This is an extract from Kyoto City Office. 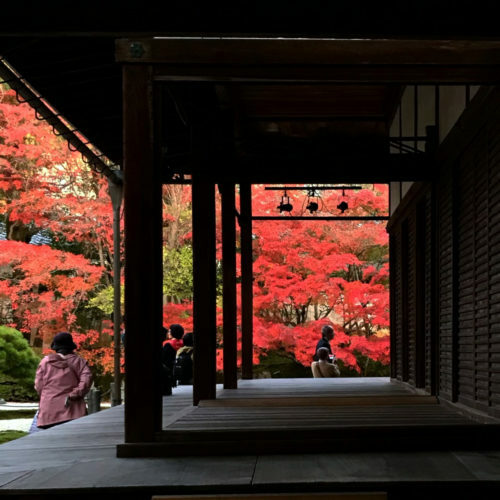 To all guests staying in accommodations in Kyoto City In Kyoto City, a new accommodation tax will be implemented starting October 1, 2018. 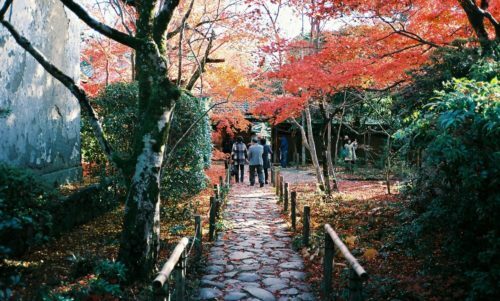 In order to increase the attractiveness of Kyoto City as an international tourism destination and to plan the further promotion of tourism, Kyoto City will impose a municipal accommodation tax on all guests staying within Kyoto City limits starting on October 1, 2018. 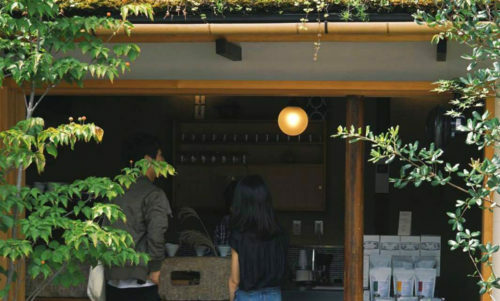 The municipality plans to use the tax revenue to conduct a more balanced method of city planning to make Kyoto both a favorable place to live and to visit. The accommodation tax does not include in the accommodation fee shown on our website, so please pay when you arrive. We are very sorry that taxes are subject to tax even for low-price accommodation like dormitory and apologize from the bottom of our heart that you will incur considerable inconvenience and burden. I am a helper-staff since last September. Time pass too quick in Kyoto. 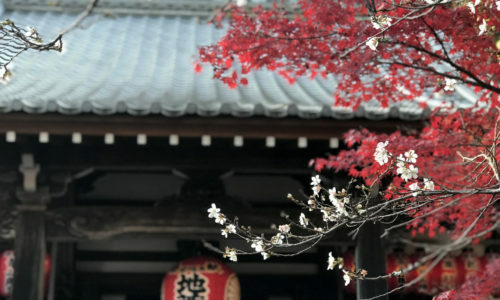 We see the leaves change from yellow to red, stcoked heat-tech from Uniqlo, we waited for the snow, and now we are preparing for the sakura blossoms. I cannot believe that I am already here for half a year. 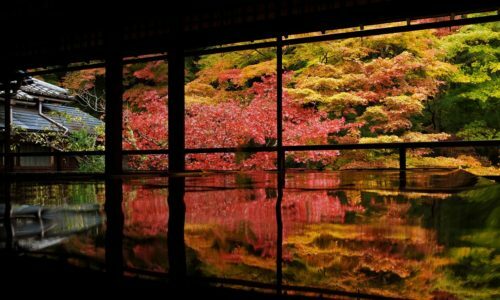 Kyoto is a typically Japanese beauty, traditional, silent and elegant. There are always something to surprise you in a small alley, it could be a café, a small shop selling something or just an old houses. Each time I find myself walk across half of the city center. It is just so enjoyable to have a walk in Kyoto. GOJO is a traditional Japanese house. It was opened by a traveler who wants to share Japanese tatami experience with other backpackers love experiencing local culture. So he started this 10 or some years ago, before tatami guesthouse is not common for backpackers’ budget. And when people gather in the living room, you know by their expression that they all love travels as much as you. I am lucky enough to meet GOJO from the very beginning. 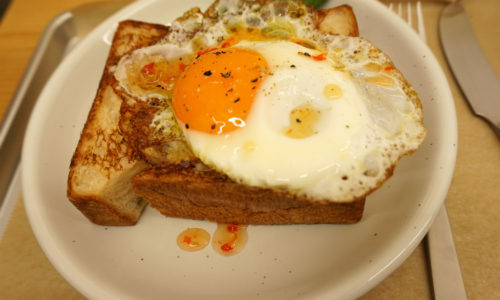 I slow down my pace, I now learn how to cook, and I think next is to make friend with a bicycle. We are looking for new helper from the mid of April! Sorry for the delay!I think winter is arriving soon,which means all the colorful leaves are falling soon. 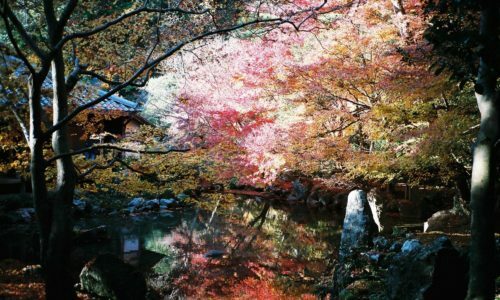 Today we are going to introduce about our private secret spots in Sakyoku Area and Higashiyama Anrea. These two areas are located in the east part of Kyoto. 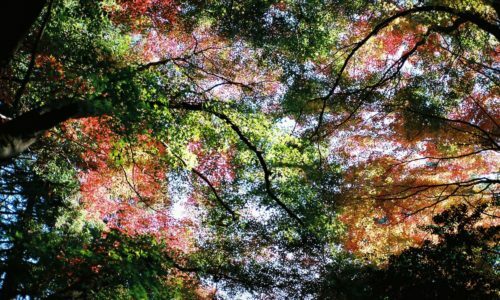 In our last blog, we introduced Higashiyama Area, which is the the Southen East of Kyoto. And SakyoKu is the northen east part of Kyoto. 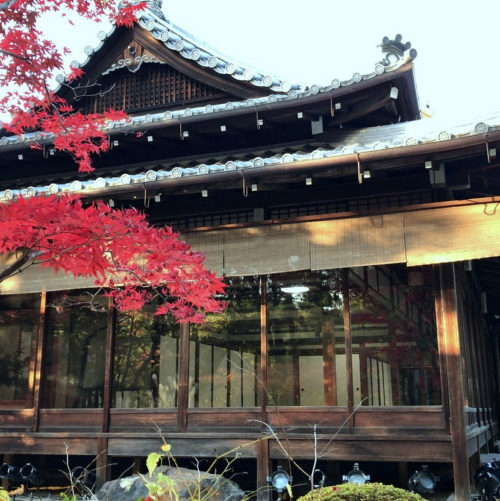 Walk 5 mins from Gojo guest house to take Keihan train from Kiyomizu-Gojo Station up north and then you can easily access to Heizan train,which is the most convenient and fast way to reach this area. Or take bus #5 on Kawaramachi street up north, in about 30 mins ,you will find yourself heading to residential area , and ginkgo trees turning yellow along the road. This area is full of young students and schools. It is a very quite neighborhood. Along Shirakawa street up north, there are a few temples that we would like to recommend to you. Nanzenji temple is near the beginning of path of philosophy. It was found in 1291. 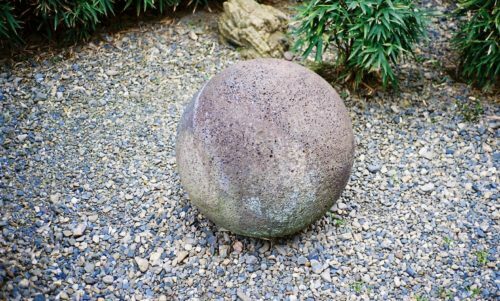 The garden in Hojo is the represent of Japanese rock garden, also called karesansui(Zen garden) in early Edo period. You will see a huge gate,called Sanmon in Japanese, when you enter Nanzenji temple. It was built in 1628, and now it is listed as important cultural property. I recommend to clam up to the gate and have a view of Kyoto city. Another view point is the photos below, TenjuAn. 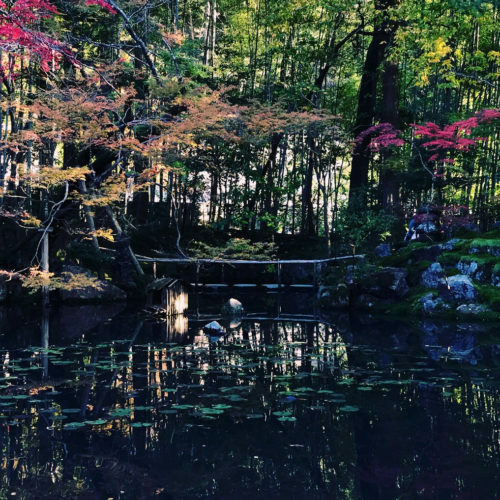 In side TenjuAn, there is a zen garden and also a Chisen- kaiyushiki-teien(a stroke-style garden around a big pond) You can see a different garden style from stone garden. I can spend the whole day here. It is very nice to watch the sun light reflection in the lake, especially if you arrive in the afternoon. Eikando right next to Nanzenji temple, another popular spot to visit during autumn. It is the head temple of Jyodo shu. The small tip, is Eikando will also put on illumination in the evening. And the admission fee is￥400 cheaper in the evening. (I visited in the evening, and my poor camera could not show how beautiful it is. So maybe you can google it??!! This is the temple built by the famous general Tokugawa Ieyasu. If you plan to visit this temple, I recommend you check their homepage/facebook account frequently during October, and reserve early entry ( 7:30am~9am),limited entry up to 70 people, usually during mid November for about 7 days. It is really nice to wake up early and visit the garden quietly. This garden belong to imperial family,so you need to apply before visit. You can apply in the office inside imperial palace one day before your visit, or they also accept same day application. You can arrive at 11am, and sign up for the tour in the afternoon. (Click here for the guideline) The reason why I also recommend this place is because this is also limited numbers of visitors. After you sign up, you can walk around the neighborhood or visit the places that I recommend below! This place is also another option to be away from the crowds. This temple is located in the north-east of Kyoto. 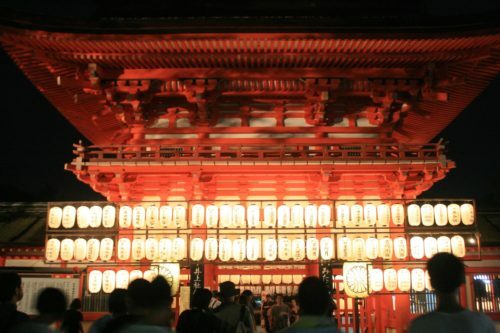 In Japan, people believe the direction of north-east is called Kimon(demon’s gate) So the important purpose of this temple is to protect Kyoto and ward off evil spirits. 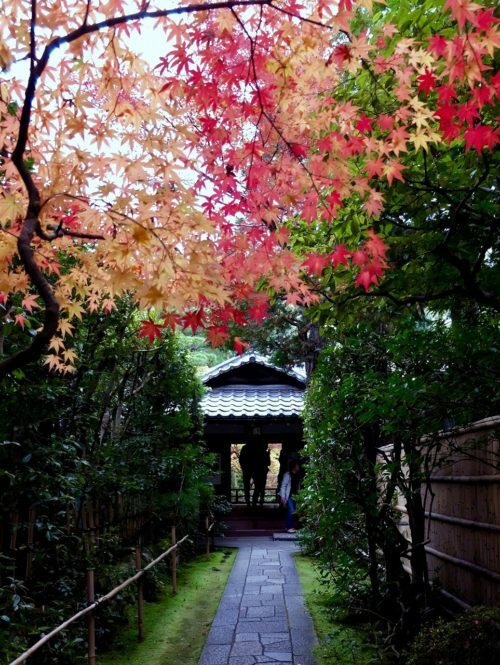 Inside this temple,you can enjoy autumn foliage together with winter cherry blossom!! This temple is recommend by Kaji. He found this wonderful secret place very close to winter sekizanzenin. The garden of this temple is also famous. 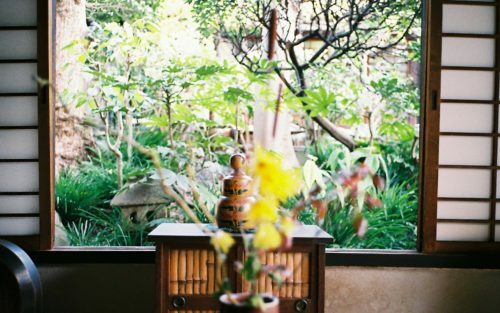 Check out these colorful photo shot by kaji via film camera! This is another wonderful place only open few weeks in spring and autumn to public. The only problem is the admission is 2000yen. Thank you for taking time reading! 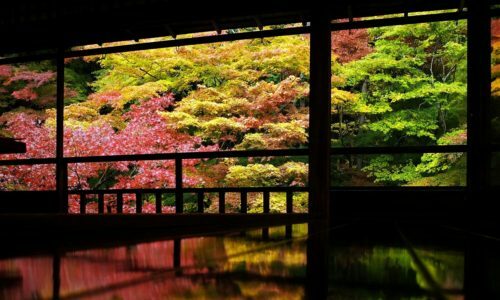 I hope you can enjoy a different colorful Kyoto! 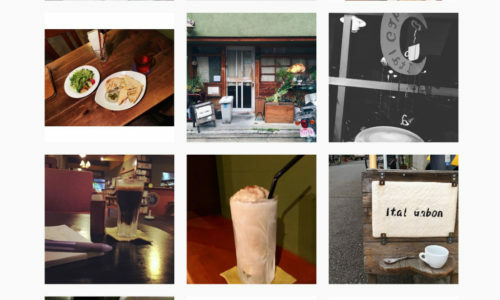 Welcome to like our instagram , and follow up more up-to-date info about Kyoto!! 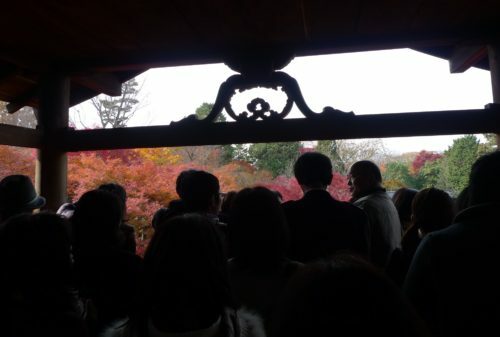 Every year during Autumn, Kyoto will be full of people. How to avoid this situation and really enjoy Kyoto?! 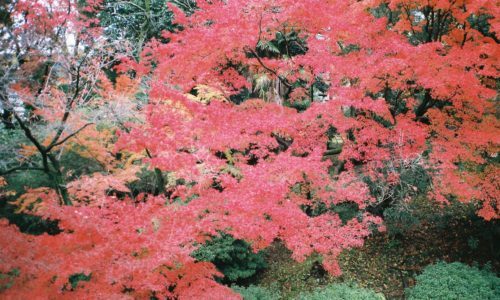 There are many famous spot for these beautiful autumn scenery, but where can I go to avoid the crowds? 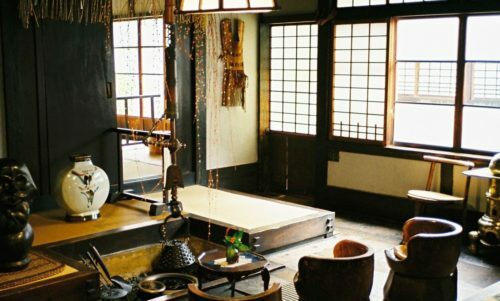 This questions often bother travelers when they visit Kyoto and tried to look for a quiet spot to rest the feet. Here we will introduce the spots that we like in Higashiyama Area (where Gojo is located) and also Arashiyama Area. 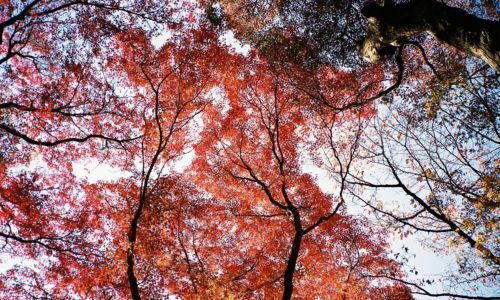 Because it is near locate on the hill near Kyoto Station(of course also near Gojo Guest House),the leaves will turn red in early November. With a short hiking, you can enjoy the clam atmosphere in the temple. 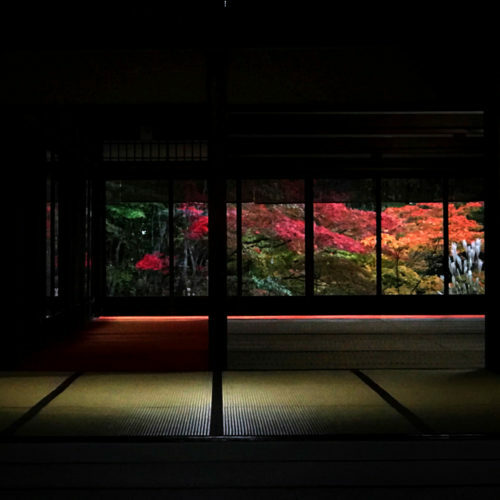 Especially, UnryuIn temple inside Sennyuji area would be open during the day and also put on illumination during the night. This area is very quite , and can be our first choice for autumn visit. Koudaiji temple and Entokuin temple is about 15mins from Gojo Guest House and 10mins from Gojo Guest House Annex. We recommended to buy the set tickets includes these two temple and Sho museum. There are illumination from 10/21 to 12/10. It would be a good choice to visit during the evening. 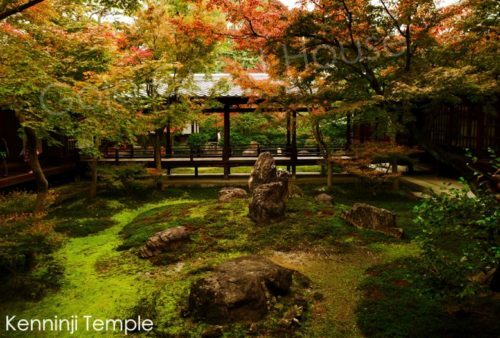 Shorenin temple which is about 20mins walk from Gojo Guest House Annex is the temple once owned by imperial family. So you will find similar architecture and quiet atmosphere inside this temple. The garden inside Temryuji temple is very well collaborate with the mountain scenery behind Hozu river. Although there will be many other visitors, I still would like to recommend to you. This temple is also in Arashiyama area, but need to talk about 15mins from the main area. There is a big lake next to the temple. And relatively quiet compare to the bamboo groove. When we speak about Arashiyama, many people will think about visit Bamboo forest. But there are often too popular and crowded. If you detour a little bit from the main area, Arashiyama Park can be a good choice to view the Hozu river. We also recommend you to take the Torokko train from Arashiyama station to Kameoka station. Along the way, you can enjoy the view of the cliffs. When you arrive Kameoka station, you can then transfer to JR Kameoka station. Or you can then take 1.5 hours boat-ride following the stream and enjoy the scenery along the river. It is a quite smooth river, and along the way, they will tell you the historical story about this area. When the weather is beautiful, the whole ride is very comfortable. We hope this information can help you a bit when you are planning your trip. 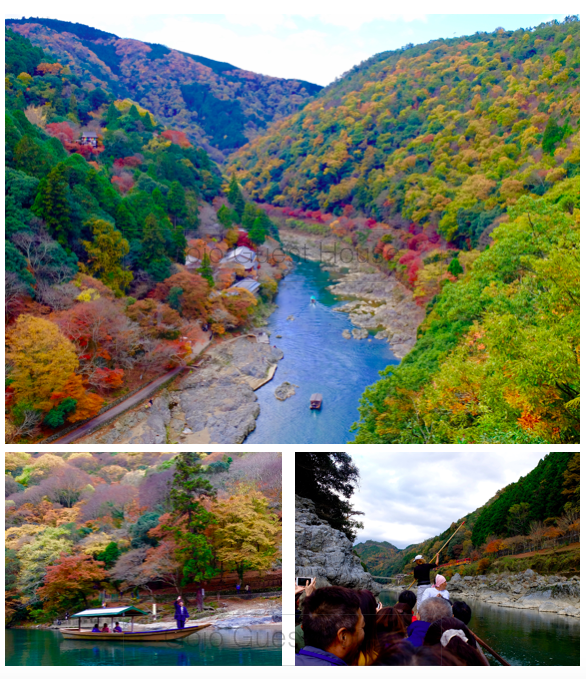 Next, we will introduce other nice spot for autumn leaves in Sakyo area and outside Kyoto City. When I visit another country. I always try to find a regular place for connecting myself to local. 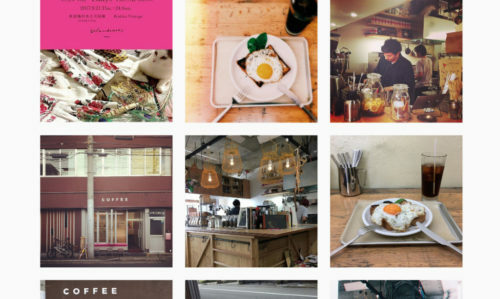 A cafe or coffee shop could be the one. 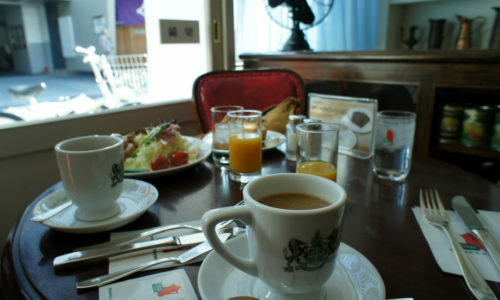 However it’s bit awkward to say something about coffee..
Because now the coffee is big topics in our daily life. If you need information quickly, please kindly skip this part. I feel coffee have gotten more power in our society. 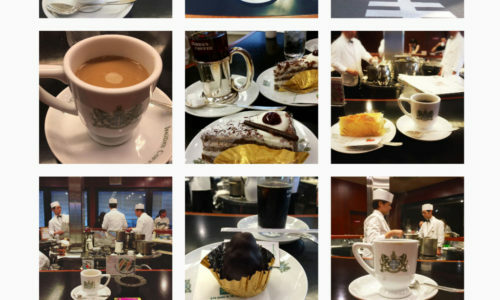 Now visiting nice coffee shop can be good reason for traveling. Or Instagram? 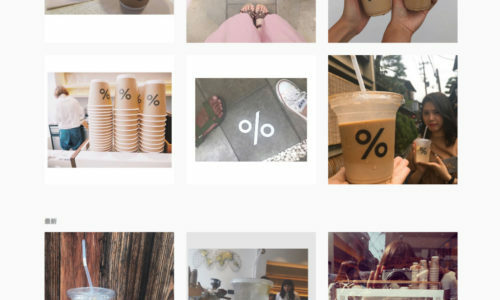 I feel there is a strong connection in between coffee and Instagram. 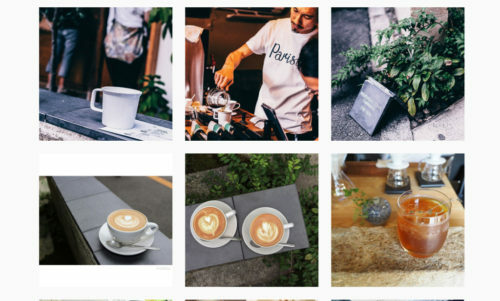 I always see a photo of handling cup of coffee in front of botanical when I open Instagram..
My friend told me Instagram improved people’s aesthetic and I agreed with it. Taking nice photo is also can be good reason for traveling but I believe seeing real thing directly is more better than recorded picture. Okay I stop. Now I’m talking about coffee..
Of course I have to mention about the taste. There are many countries producing coffee beans and those beans have different character. And the taste also change how they took care, how they roasted, how they made. 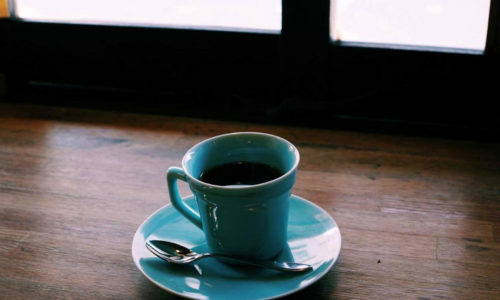 I feel we can discover about coffee forever. Sometimes I cannot follow the conversation when my ballista friend is talking about coffee deeply. I like coffee but standing instant coffee in the kitchen is also enough for me sometimes. Maybe I’m enjoying to see their different style. Those surrounding things around coffee shops like their interior or graphic design, appearance, performance. 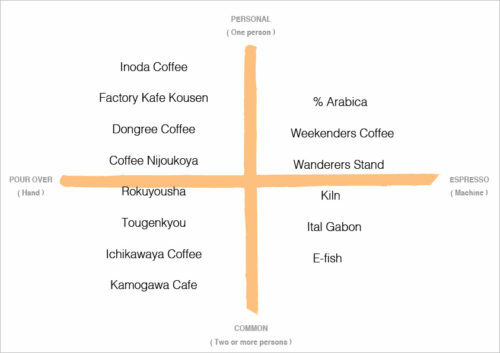 There are many individual coffee shops in the world and they have each different character. The people made it and I appreciate I can experience those things from their place. 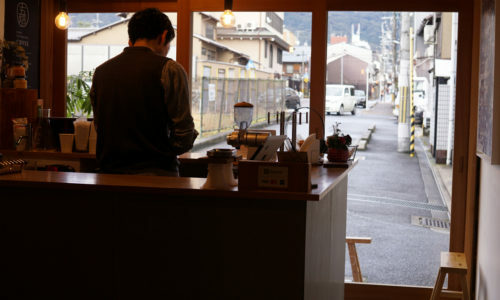 This time, I asked to my colleague Keita san who had been working for some coffee shops before. I used to ask recommendation from my colleagues in Gojo because they have each of favorite place. So please feel free to ask for recommendation to us. 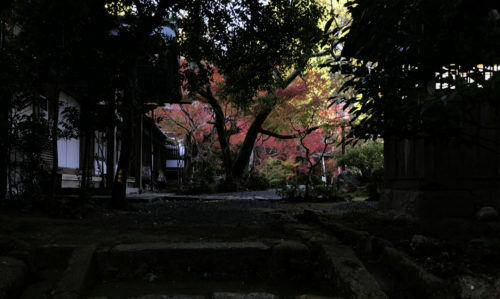 But for me, I’m not sure if you say “What is best thing in Kyoto?” or “What do I do in Kyoto?” because it’s your travel so I hope you think by yourself like at least what would you like to do or what would you like to see because it’s good opportunity to know yourself through those considering. Then it will help us in the future when we think about what we are going to do in our life. Okay then here is the main subject. 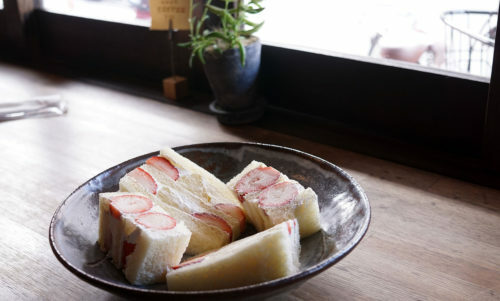 This article is from our conversation, thanks Keita san. 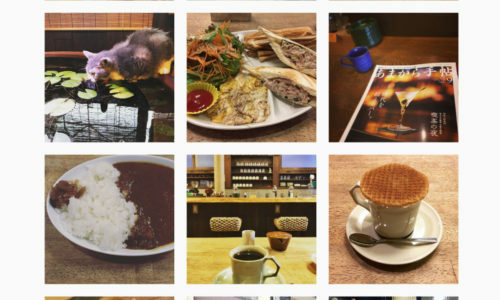 He is discovering coffee in Kyoto and always give me good recommendation for shops or movie or music too. 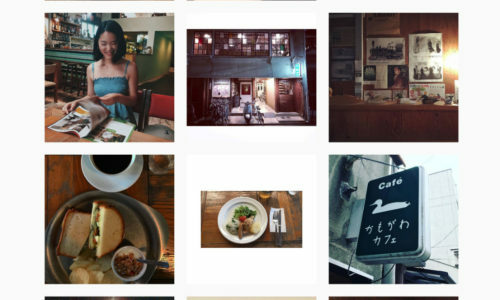 Those some photos took by Keita san too. These thought are from our subjective so please don’t hit us if we say wrong and unexpected things for you..
First, we put 4 categories. POUR OVER and ESPRESSO means the way brewing coffee beans by hand or machine. PERSONAL and COMMON means good for visiting by one person or two more person. By the way coffee is KO-HI- in Japanese. Please remember if you would like to order in Japanese haha. Elegant manners and performance by kindly owner in classic Japanese style renovated building. Excellent roasted beans has so much rich flavor. Food and Sandwiches are also tasty. Closest from our guesthouse. You can try 5 small cups of coffee beans from different roaster. You can try that only in here and it’s special. They also sell some products. The technique he brews pour over looks like magic and taste deeply good. 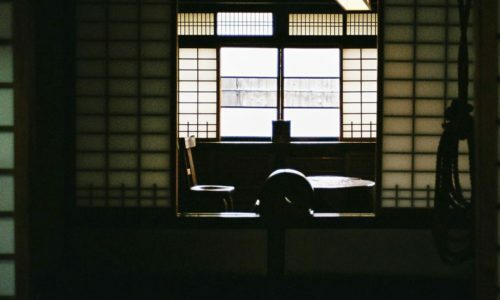 Koya means hut in Japanese so the place is small and lovely and cozy.You will be amazed. The way they take care coffee is like craft man. They do Nel drip delicately. The table manners is also unique. The place is like small hidden studio in old school. This place for any kind of people. It’s like they are always there and be there forever. Being here is so chill and cozy. Simple snacks are also nice. Recommend to sit in downstairs floor. 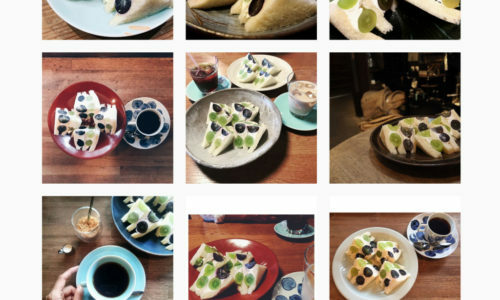 They are one of most popular original individual cafe in Kyoto. Good for two more persons. 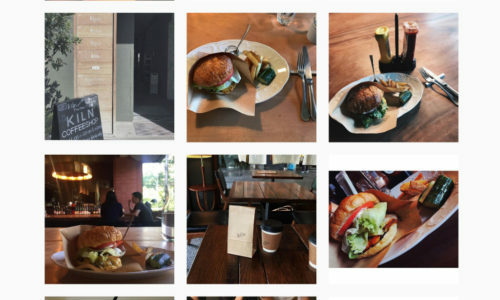 They have nice foods and drinks for lunch or dinner. Feel lots of ideas by talented owner. They do Siphon coffee and it taste good. 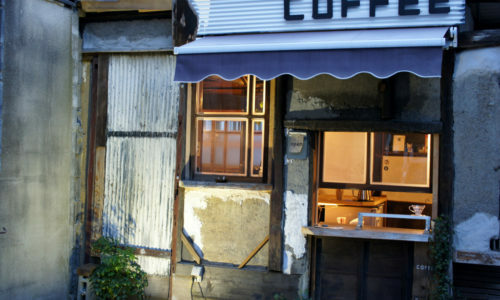 They are popular cafe for local people in the town. Especially their curry and rice. Coffee after curry is favorite style in Japanese so please try. 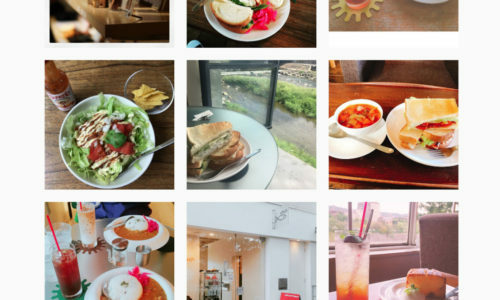 It’s one of the branch of famous chain cafe in Kyoto. 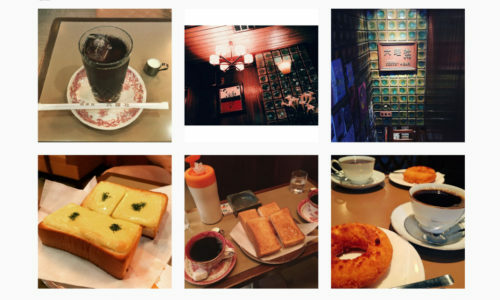 Especially this place has atmosphere as this is Kyoto classic. 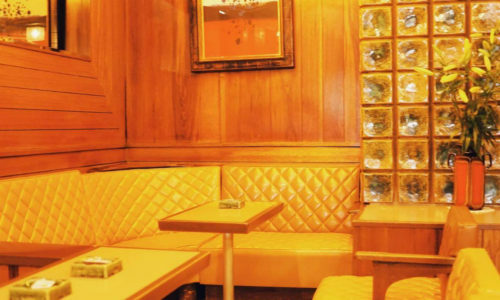 The staff and customer are gentleman and feel history in each of them. 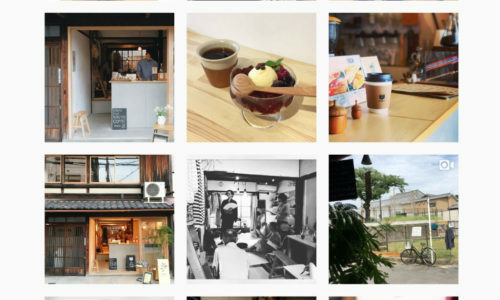 They are most popular coffee shop now here in Kyoto. Everything is high quality. The espresso machine is called slayer and it’s hard to find in Japan. Good for the people from all over the world. Here is their 2nd shop and it’s small beautiful Japanese tea house. Feel more Japanese aesthetic and their own style from their individual character. They roasted many kind of beans and those are so tasty and enjoyable. They opened recently and they have been popular. They bake simple square bread there. And they serve toasted bread with some toppings. Toasted bread and good coffee make your day. One of the most relaxing place as they located close by Kamo river. The view from the windows and their healthy and seasonable foods and drinks provide you good time. Good for vegetarian too. Their espresso is so great somehow.And their panini is also so tasty. It’s like hidden place on small street. Maybe good for rainy day. For reading book or enojoy chatting with friend. Their pasta is also tasty. Located in down town area. Coffee and snacks are good. Sit close by small river and take rest for next discovering city. They have restaurant upstairs and it’s also popular. These place are where we had been to and we liked. Hope you will get some nice coffee in these place. 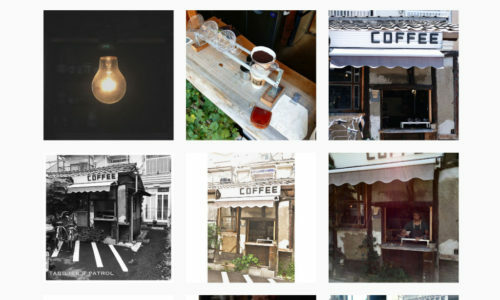 There are so much more classic and new coffee shops in Kyoto and it’s inventing everyday. I let it leave for next time. 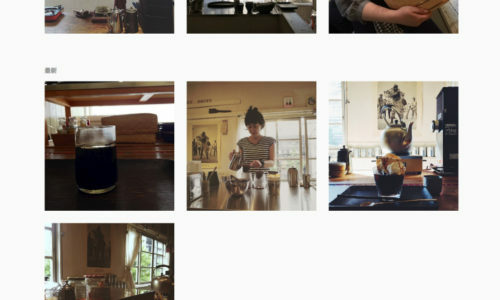 Have a nice coffee and trip in Kyoto everyone. Now, we are looking for a new helper staff from middle of September. Summer!! In Kyoto is HOT and HOT and HOT. 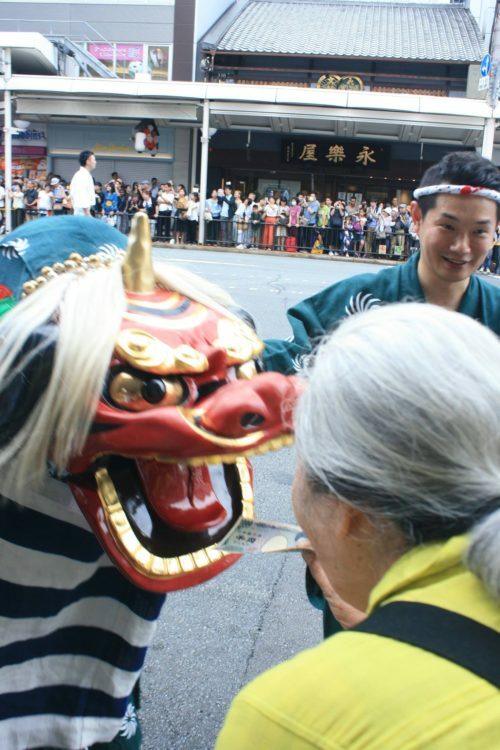 I hope everyone of you have enjoyed KYOTO GOJOZAKA POTTERY FESTIVAL held on Gojo Street in front of Gojo Guest House. (Yes! the street right in front of Gojo cafe! No need bus transfer, no need to bike, just open the door, there you go!) 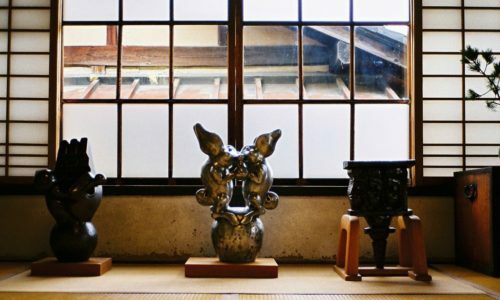 For the Japanese pottery lovers who are not here yet, check out the homepage of this event to plan your Kyoto Trip NEXT year. Okay, well, what I REALLY wanted to share is the information about Hanabi (Fireworks)in 2017 to all the friends to Gojo Guesthouse. 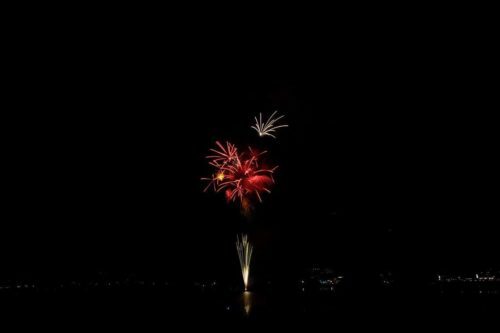 As you know, summer is the time to bring a handfull of bear and sit down by the river or lake side and enjoy the firework show. 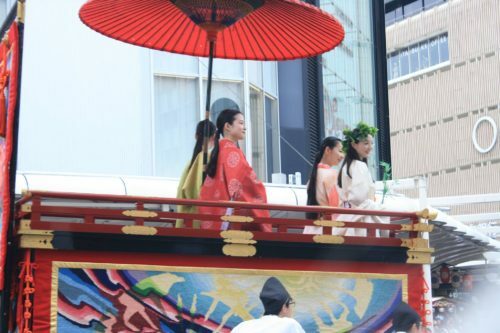 Most people will wear 浴衣　Yukata (the simplest Kimono, the Japanese traditional dress in summer) and the wooden 下駄 Geta, and hold a 扇子　fan. A guestfrom the hostel asking me about Hanabi information, I released that most of them are in Japanese. 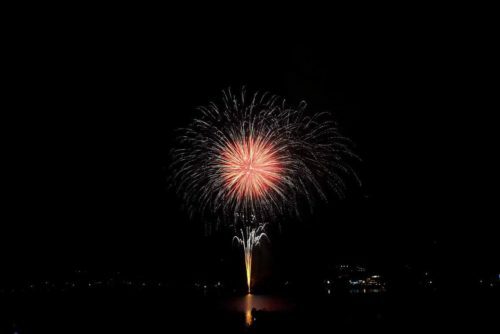 I would like to quickly share some of the selected Hanabi information with you with some useful link. Location:Shiga prefecture Otsu city / Shiga prefecture, the coast of near Hamaotsu train station. This is 9min by JR from Kyoto station! !Super close. Well, if you bike, it should take about 1 hour or more??!! 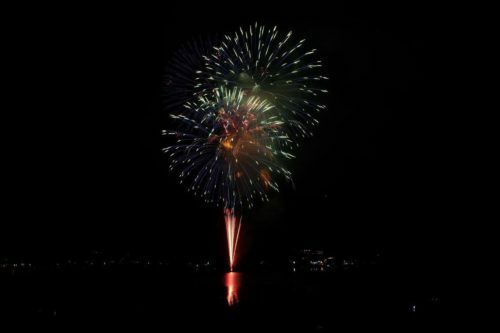 Actually, there are also a lot of other Hanabi event happening in Japan during summer. and look for the calendar or location to set up your travel plan! *Note: Sometimes the event will be postponed due to bad weather condition,so make sure you double check again before you go. I am the helper staff from Taiwan. My name is Takashi. In Japanese Kanji , it is written “貴”. Have you all enjoyed the summer? Here is what happened in Kyoto. 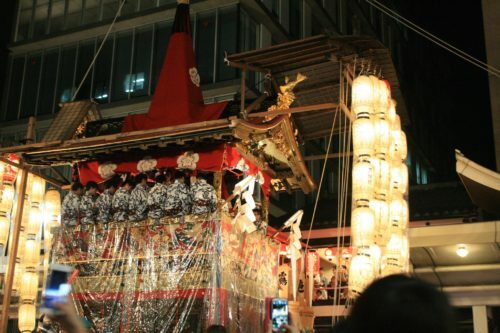 The Gion Fesitval-祇園祭, one of the biggest festival in Japan. I am happy I had this chance to join this festival. In order to experience different culture and language, also to recharge my battery during this year, I chose to visit Japan, and first stop is Kyoto. Even if this would be my third time visiting Kyoto, I was super excited and meanwhile a bit worried, because this time I am here to stay for a whole year and to learn. It is very different from to travel to some place to live there. I prepared two giant luggage to cope with my new life in Kyoto. I was very lucky to come to Gojo Guest House and become the helper staff of this hostel. It is a unique backpacker’s hostel. 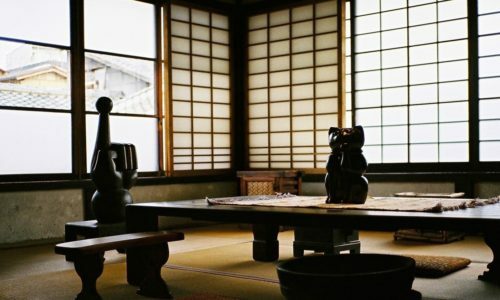 This guesthouse is a very traditional wooden Japanese building, but there is a café on the 1st floor. This allows all the travelers from different countries can communicate with each other in this open space. Over the long table in the café , you can often see people talking and laughing as if it is a small meeting in UN. At that moment, I wasn’t sure why this hostels always gives good vibes that attract people once you are here until I heard the story of Gojo Guesthouse and saw the old photos from the neighbors of hostel . This hostel was traditional Ryotei Ryokan(the Japanese way of saying traditional accommodation + restaurant) , and now it transformed to a hostel & Café now. 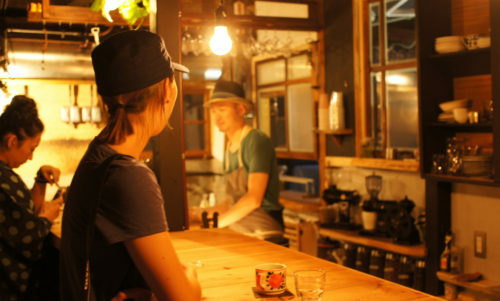 Some efforts were made,such as to add a long table in the café to shorten the distance between travelers, but also keep the Japanese traditional atmosphere in the hostel. 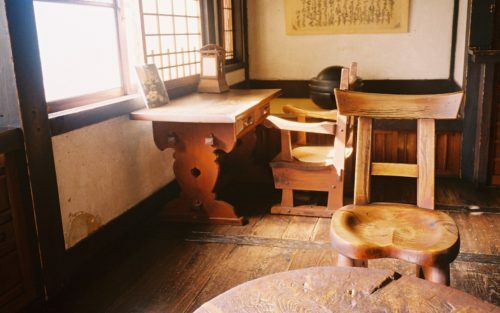 Not only the long table allows people to chill out, you can find a quiet spot you like, such as a small sofa space to read or write your travel notes or just go back to your tatami bed upstairs and relax the sore feet. 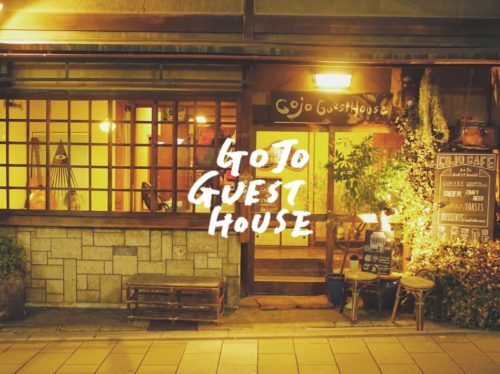 I guess it is why I would prefer to call Gojo Guesthouse,another home in Kyoto. It has been four months since I arrived Gojo Guesthouse. At the very beginning, I couldn’t understand neither Japanese nor English well, but now I can communicate with guests from other countries little by little. With the improvement of level of Japanese, I could learn more Japanese culture and to understand the difference. Though there is a lot more to learn, but the staffs in the hostel are always very patient and supportive which help me a lot. Below there are more photo to share with you. See you!! This is totally my personal point of view! Haha but it’s good to put this “most~” “best~” title to fish.. sorry. There will be other titles about most beautiful blablabla as series maybe.. ? To be honest, I feel it’s also fun to discover our own best things by ourselves. But it’s also nice to get some recommendations from someone who knows your taste or friend or friend of your friend. Especially when we are traveling abroad far away from home. However, I try to do my best to introduce this place. 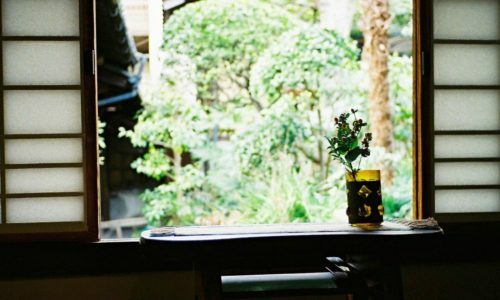 I would love to recommend here if you have interest about Japanese life, craft, interior, building. Kawai Kanjiro was pottery artist originally but he also did sculpture, calligraphy, poetry and furniture, interior, product design. I can say he was very talented craft man as designer and artist at that period. I feel like there is a distance in between craft and design and art but he was interactional each of those. I think he is best Japanese potter ever. It’s impressive how he could keep creating with joy and challenging. It looks like he had never gotten bored with it. He and his family worked and lived in this house and studio everyday. He created tons of potteries in this place. And this house supported his massive creation as space. He also designed this place. It’s used as his memorial museum after his passed away(in 1966, he was 76 years old). 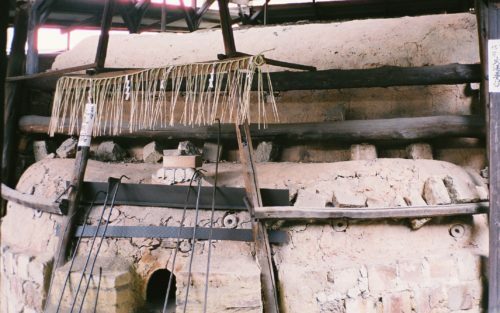 At there, you can see his works and many crafts he collected, interior furniture, garden, huge kiln, books. Especially those chairs, he collected many chairs from Africa, South America maybe Europe, in Japan as well. I remember that I met one Spanish family at the museum and they were so excited. They said there is a chair made by their grand father but they couldn’t tell that in Japanese to the staff. I translated their exciting random Spanish and English by Japanese and told that to staff there. The staff brought a old book and show the family then there was a photo of their grand father in the book.. They looked so happy like explosion! Sometimes I think stuff is just stuff but it has more value or can be important when it has a story or memory. Especially there are so much story in crafts and it’s interesting to discover the background. 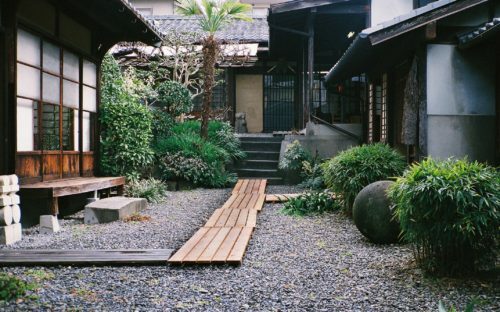 Everything is beautiful with gently atmosphere in traditional Japanese style building like great harmony. We still can feel his daily living life from this place. There are some books about him selling at the reception. I really like the title of the book from his word. It’s “We do not work alone”. I bought it for myself but I gave it to someone and bought new one for myself but gave it again to someone and bought it again then maybe I will give it to someone again one day haha.. I feel like I can describe forever about here.. maybe not here, about this great lovely person Kawai Kanjiro but I stop here. Anyway, please come visit there and touch the feeling of him. Then I would love to hear how you felt. I like to know how we see the things in each different point of view. I almost forgot to say but it’s about 10 min. walk from our main building!